"This spud's for you! 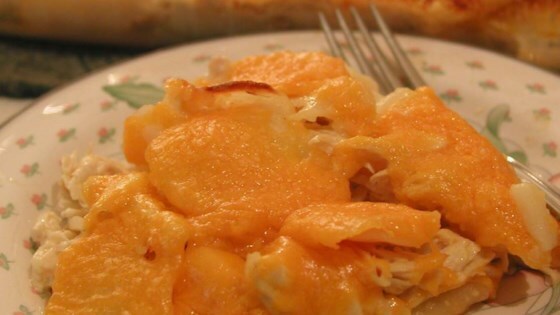 It is a cheese, potato and chicken delight! You can make the same dish with pork chops - it's great." Heat oil in a medium skillet over medium high heat. Add chicken breasts and saute until tender. Meanwhile, prepare potatoes according to package directions, adding 1 cup (instead of 2/3 cup) of milk and sliced potatoes. When chicken is tender, remove from heat, let cool and shred. Add shredded chicken to potato mixture. Fold chicken/potato mixture into a 9x13 inch baking dish. Cover and bake in the preheated oven for 25 to 35 minutes. Add cheese and bake for another 10 minutes.